Note: These pajamas were purchased by The Lingerie Addict for the purposes of review. All opinions are my own. In all honesty, silk pajamas were never really something I wanted. It goes without saying I’m a fan of silk: no other fabric quite compares to its flow, sheen and lustre. 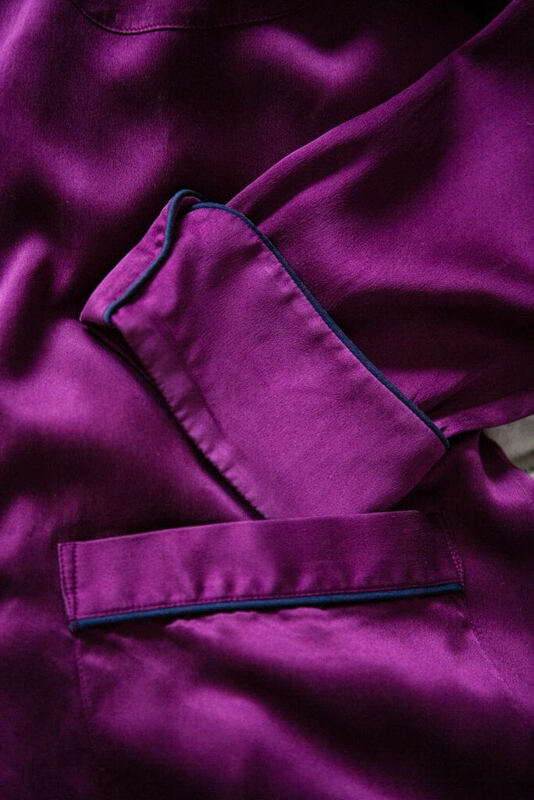 A good quality silk is the epitome of luxury. Yet to me, silk is incongruous with the act of sleeping. It’s difficult to wash and it doesn’t stretch. I’m a restless sleeper, therefore my sleeping attire tends to lean heavily towards cotton jersey. I choose nightwear that stretches and moves with the body and can just be thrown into the washing machine. It’s by no means glamorous, but it is practical. 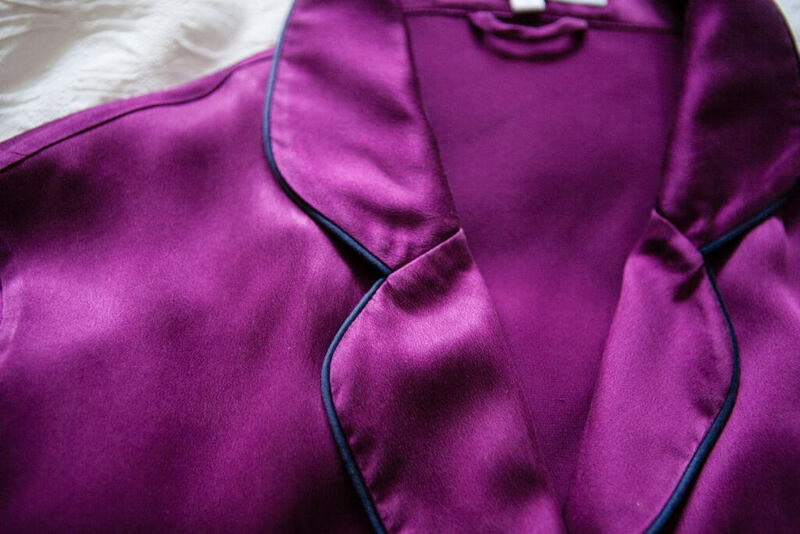 Olivia Von Halle has carved out a niche in the industry as a leader in luxe sleepwear. 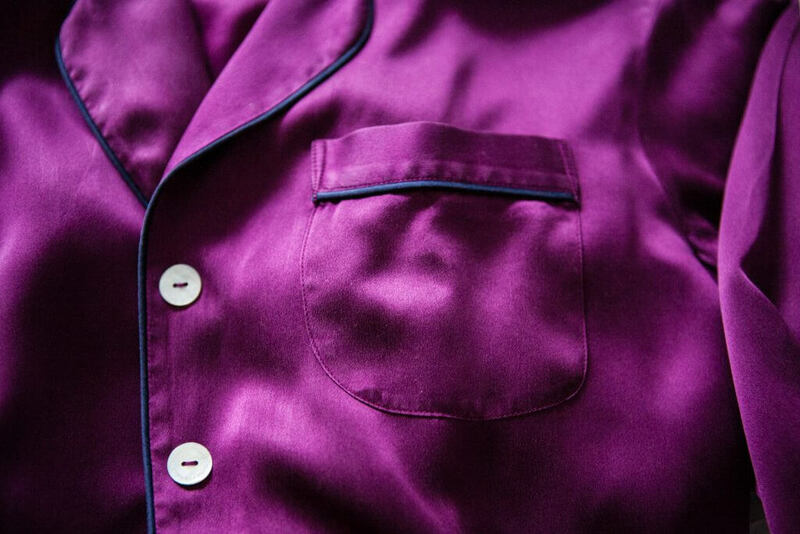 Their forte is traditionally tailored pajamas inspired by the glamorous 1920s. 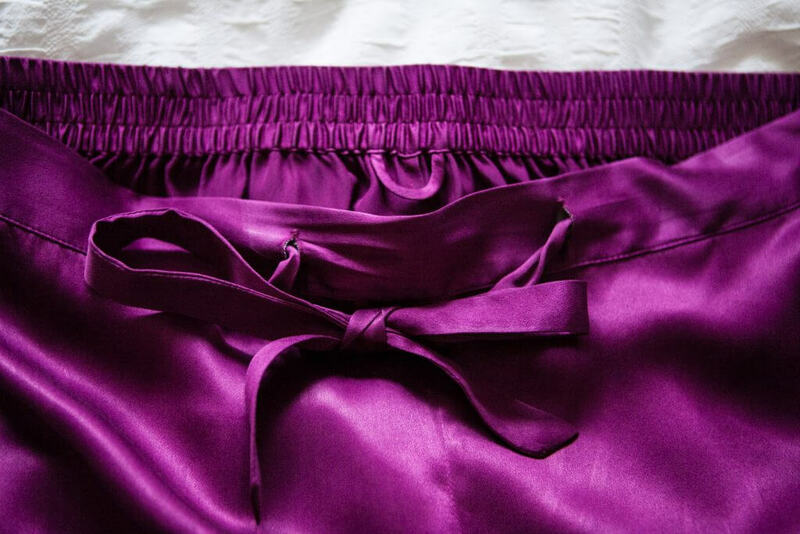 There’s an impeccable attention to detail in their nightwear, from contrast piping and silk drawstrings to adorable pockets. The price point is at the higher end of the market, which isn’t surprising given the volume of fabric used as well as the intricate details. The brand has a core range of silhouettes offered in different colourways and prints each season. The Coco range retails at around £350 ($440) and is available in sizes 1-4, equivalent to approximately a S-XL. Like most luxury lingerie brands, the core size range is quite narrow, but the brand does also offer a made-to-measure option. I purchased the Oxblood colourway in a size 2 (roughly a UK 10-12 or US 6-8), a deep rich red-purple with navy blue piping. This colour is now sold out (though the plum appears to be quite similar), but there are plenty of other colours and prints available. The brand also offers a range of camisole and short sets, robes, gowns and even tracksuits. When the pajamas arrived, I was blown away by their sheer luxury. Attention has been lavished over almost every detail. The Coco pajamas comprise of a button up top and drawstring trousers. The top has a notched collar, a breast and two hip pockets, and turned up wrist cuffs, all edged with contrast navy piping. 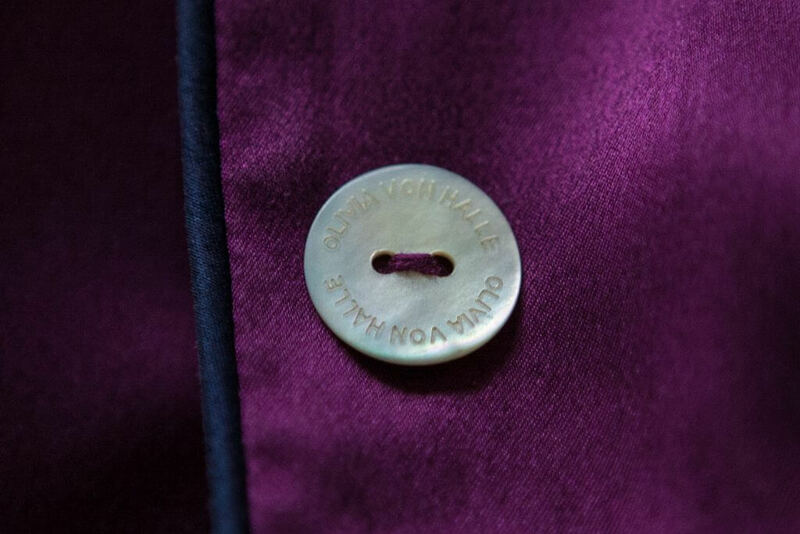 That same piping follows the centre front edge, which fastens with mother-of-pearl engraved buttons and sewn button holes. The matching trousers feature a shirred elastic waistband through the back of the garment, a silk drawstring at the front, and turned up cuffs and decorative piping along the side seams and cuffs. The cuffs on both garments are stitched in place so altering the length of either of them would likely be challenging. Both garments also feature a convenient rouleaux loop of silk at the back of the neck or waist allowing for easy hanging of both pieces. The construction on both pieces is impeccable. There are a lot of challenging details and construction methods requiring a very experienced seamstress and a great deal of technical accuracy, such as the contrast piping and narrow French seams. The majority of the garment is put together with French seams (an expensive construction technique that encloses the fabric’s raw edge within the seam), with the exception of the piped side seams on the trousers and the attachment of the cuffs. These are simply overlocked together (a type of stitch that encloses raw fabric edges in thread). I presume this method was chosen to avoid excess bulk due to the piping detail and extra layers of fabric. 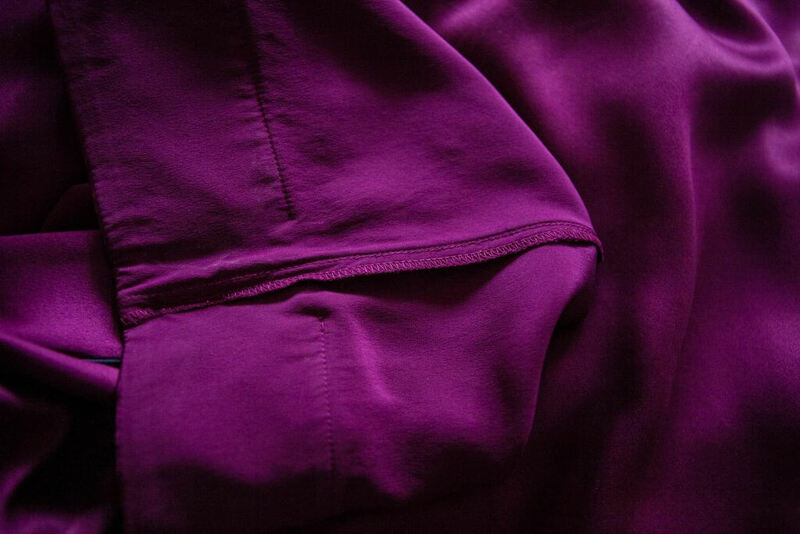 Although overlocking is often viewed as a cheaper construction method, in this instance, I would say it’s preferable as it makes the garment flow better and wearing a more pleasurable experience. It is also worth noting that in 1920-30s loungewear pieces, it was not uncommon to see raw fabric edges or pinked seams. The modern garment industry appears to be obsessed with never leaving raw fabric edges as though this is a sign of poor quality or low garment longevity. The fact is there is a time and place for all construction methods. 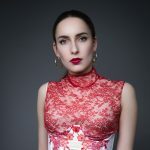 Both garments are made in China, which isn’t entirely surprising given the level of impeccable finishing and polish to these garments: they require a seriously experienced factory. Whilst I have no doubt factories in Europe might be capable of this level of quality, the lower labour costs in China mean more time and attention can be dedicated to these details without exponentially increasing the final garment cost. This pajama set is designed for comfort with a loose, easy fit. The flowing cut means the set will work for a range of body shapes. The size 2 fits me well with the elasticated waist of the trousers sitting comfortably just above my hips. The top also works well. The fit is relaxed without looking like it's swamping my body. The arm and leg lengths are good for my body, but it’s worth noting that I'm 5’7”; they might come up excessively long on people of shorter stature. Choosing the correct size for your body is a little more complicated than other brands. The brand has its own size chart and you determine your pajama size by a combination of dress size and height. Going by this size chart, I am on the border between sizes 2 and 3. Even sizing down, I found it's still a good fit. What I love most about these pieces is they’re not only incredibly comfortable, but also just so elegant. I don’t personally enjoy sleeping in them (that’s largely due to being a restless sleeper and getting tangled up in them! ), but they are simply perfect for lounging around the house. Indeed, they’re so glamorous that I’ve been genuinely tempted to wear them out of the house – perhaps not as a matching set, but the breathable silk trousers would be perfect in the summer. I’m honestly pretty in love with these pajamas. They’ve far exceeded any expectations I had. There’s something in the relaxed elegance and refinement that elevates them beyond simple sleepwear. In an industry where there’s almost too much choice, Olivia Von Halle has eschewed the likes of lace and other frivolous embellishments to focus on doing simplicity well. I couldn’t personally think of a single way to improve the quality or cut of these garments. I just wish that I could afford to fill my wardrobe with them! Readers: do you like to sleep in silk? Have you ever tried Olivia Von Halle? I love sleeping in silk, it doesn’t hold the heat like polyester so is very comfortable. I find the slickness of the material easy to move in as I toss and turn at night even though it’s not stretchy. This piece is so very beautiful I wish I could afford it.